Thrifting is usually slow this time of year in northern Minnesota due to cold weather. I have been going through my stash of junk in the garage looking for things to repurpose and/or upcycle when I came across two sets of bookends. I am pretty sure that these dark stained wooden bookends were homemade. I gave the wooden set two coats of Annie Sloan Chalk Paint in "Old White". Next I distressed the bookends with 220 grit sandpaper. I then stenciled on a "2" and a "7" on the bookends. 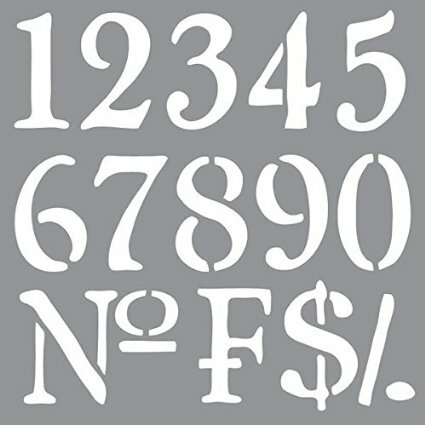 This Old World Number stencil is from Decoart. They look like they were made from a picket fence! Perfect in a farmhouse style kitchen for cookbooks! This is the set of pretty ordinary metal bookends. I painted this set with Fusion Mineral Paint in "Algonquin". I stenciled the ends with more numbers. I then waxed the bookends with clear wax. I find that it gives the Fusion Mineral Paint an aged appearance that I like. These bookends have a more "industrial" look. More upcycled projects from my stash coming soon! It is amazing what a little paint and a stencil can do. Great makeovers. Both pairs turned out great! My faves are the wooden ones.